The movie “It’s a Wonderful Life” is a classic that needs to be viewed periodically. In this scene George is in front of the old abandoned house and has just asked Mary”‘What do you want? 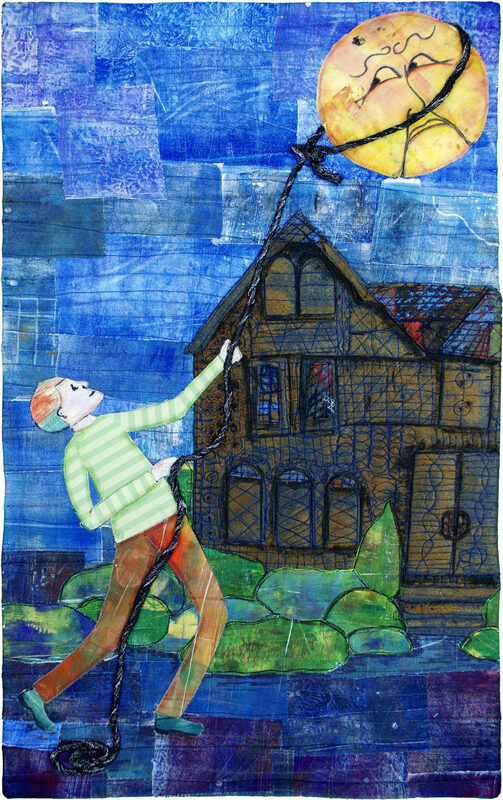 You want the moon?” This piece takes that question one step further, and we see George attempting to lasso the moon. The old house is created out of distressed, burned and melted felt. Raw edge applique, monoprinting, painting, burning, melting. Commercial fabric, hand painted and printed fabric, paint, colored pencil, Inktense, felt, twine.